The main opposition Maldivian Democratic Party (MDP) has called on President Abdulla Yameen to honour commitments made to release former president Mohamed Nasheed and other jailed politicians. Instead of releasing Nasheed on Thursday as rumoured, the state decided to appeal his terrorism conviction. His 13-year jail term, however, has been commuted to house arrest. Revealing details of the government’s demands for the first time, the MDP said President Yameen had requested opposition backing to amend the constitution to set new age limits of 30-65 years for the presidency and vice presidency, and the impeachment of Vice President Dr Mohamed Jameel Ahmed. The government also asked for legislative support for specific projects, later revealed to be a second constitutional amendment to allow foreigners to buy land in the Maldives. The MDP said it had delivered on all counts by issuing a three-line whip on the first two demands, and a free whip on the controversial foreign freeholds amendment. The party said it had also complied with a moratorium on street protests. The free whip on foreign freeholds has divided MDP supporters. The party said it had issued a free whip line because it believes in free ownership of land and property, but had reservations that the amendment could lead to foreign, non-commercial logistical installations or military bases being built in the Maldives. 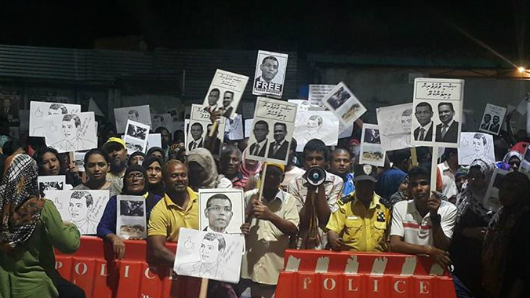 In return, it had asked for freedom for political prisoners, including Nasheed, the dropping of charges against more than 1,000 political activists and reforms to the judiciary and independent institutions. The government agreed and home minister Umar Naseer made a number of promises during the talks that began on July 1, the party said. “The MDP believes the government of Maldives must follow through on its commitments before the Independence Day celebrations on July 26,” the party said. Stressing that it had entered talks with the government in good faith, the MDP said it had hoped to see meaningful reform to the “hopelessly politicised and corrupt” judiciary and independent institutions. Further, the party also wished to usher in a parliamentary system of government for the Maldives. Nasheed’s legal team on Friday called the Prosecutor General’s decision to appeal the terrorism conviction “a charade,” and said they will make a decision to participate after discussion with the opposition leader’s international legal team. The lawyers said the appeal could affect ongoing talks between the opposition and the government over the release of jailed politicians. In a brief statement on Thursday, the PG office said the decision to appeal the conviction was made based on concerns raised over due process in the trial and Nasheed’s request for the PG to appeal the conviction as well as his contentions over procedural violations, insufficient time to mount a defence, and inability to appeal due to the criminal court’s failure to provide a full report and transcripts of the trial within a 10-day period for filing appeals. Diplomatic pressure had been mounting on President Yameen to release Nasheed, but the international community has been silent since the MDP started negotiating with the government. The Commonwealth Ministerial Action Group (CMAG) opted to keep the Maldives off its agenda soon after talks began. President Yameen has now asked the parliament for its counsel on leaving the Commonwealth. The UN working group on arbitrary detention is meanwhile expected to rule on Nasheed’s imprisonment in September or October. In a response to the UN, the government insisted Nasheed must appeal the sentence. There appears to be no progress on the release of the Adhaalath Party president or two former defence ministers. The president of the religious conservative Adhaalath Party Sheikh Imran Abdulla was transferred from a police remand center to a high security prison on Thursday. He is charged with terrorism and is awaiting trial. Suspects awaiting trial are usually kept at the Dhoonidhoo Island Detention Center, and only convicts are housed at the high security prison on Maafushi Island. The transfer signals a reversal of the government’s conciliatory stance on making concessions for jailed politicians. Instead of freeing former president Mohamed Nasheed as rumored on Thursday, the state decided to appeal his 13-year jail term on terrorism charges. Meanwhile, former defence minister Mohamed Nazim, who is serving a jail term on weapons smuggling charges, was brought to Malé for treatment on Thursday amidst rumors he may be transferred to house arrest, but he was taken back to prison on the same day. Imran is charged with terrorism along with Jumhooree Party (JP) deputy leader Ameen Ibrahim and council member Sobah Rasheed. Ameen and Sobah have fled the Maldives. The three are charged with threatening to harm police officers and inciting violence at the May Day protest. Charges were pressed under the 1990 Anti-Terrorism Act. So far only one hearing has taken place in Imran’s trial. He has denied charges. The trial has been stalled since early June after two of the three judges on the criminal court were appointed to the High Court. The High Court in late May rejected an appeal challenging the criminal court’s decision to hold Imran in police custody until the conclusion of his trial, claiming it could not review decisions of judges to hold defendants in custody for the duration of a trial. The Adhaalath Party has meanwhile said that Imran’s health is worsening under police custody. He has been brought to Malé several times to consult specialist doctors. On June 21, the party said that Imran has diabetes and high blood pressure. Tests conducted after his arrest show high blood pressure and cholesterol levels as well as high urine acidity. He is also suffering back pains as a result of having to sleep on a hard surface, the statement added. Imran’s continuing incarceration is a “planned and shameful atrocity carried out to psychologically and physically weaken him,” the Adhaalath Party said. The party also said Imran’s wife has written to the home minister and the Human Rights Commission of Maldives to express concern over his health. 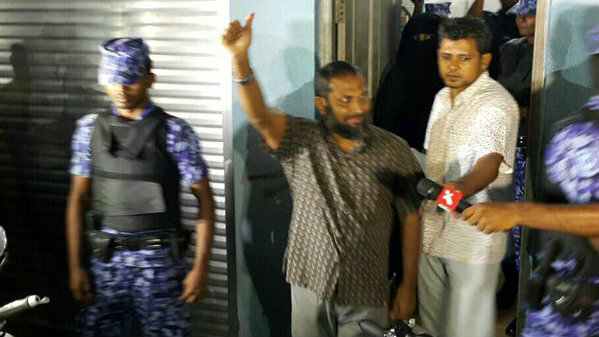 Imran was first arrested on the night of May 1 and held in remand detention for 26 days. Hours before the criminal court ordered his release on May 27, the High Court overturned the criminal court’s May 17 ruling to keep Imran in police custody for 10 days. The appellate court ordered his transfer to house arrest, noting that Imran has diabetes and that tests conducted following his arrest showed high levels of blood pressure, cholesterol, and urine acidity. A doctor had also recommended that Imran should not sleep on hard surfaces due to a spinal injury. Imran was arrested again on the night of June 1, a day before the terrorism trial began. Questioning the state’s decision to appeal a terrorism conviction against former President Mohamed Nasheed, lawyers revealed today that the opposition leader’s 13-year jail sentence was commuted to house arrest on July 19. “The government of the Maldives has permanently moved President Nasheed to house arrest for the balance of his 13-year term in prison,” the opposition leader international lawyer Jared Genser told reporters in Colombo this afternoon. The Maldivian high commission in Sri Lanka confirmed the move to AFP. Nasheed’s domestic legal team told Minivan News the decision had been communicated in writing. The PG office announced the decision to appeal the guilty verdict yesterday amidst rumours that President Abdulla Yameen will pardon Nasheed in exchange for the main opposition Maldivian Democratic Party’s (MDP) backing for several crucial votes in parliament. 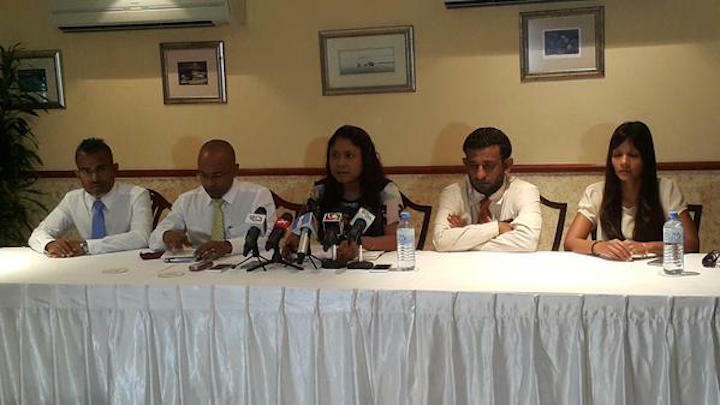 Speaking at a press conference in Malé today, lawyer Hassan Latheef said the legal team believes the government has exerted undue influence over the PG to appeal the case in a bid to appease growing international pressure. The European parliament, the British prime minister, the US secretary of state, the UN Human Rights Council and various international organisations have called for Nasheed’s release, Latheef noted, adding that the legal team had expected the former president to be pardoned as a result of talks. But President Yameen could now “tell the international community that President Nasheed’s case is out of his hands,” Latheef suggested. “We believe that there is intense foreign pressure on the government to release President Nasheed and the case was on President Yameen’s table. But we now believe that the government has sent the case to the prosecutor general’s table,” he said. The government will be able to tell the numerous foreign diplomats expected to arrive in the Maldives to attend an official function to celebrate 50 years of independence on July 26 that Nasheed’s case has been appealed by the state, Latheef said. Some diplomats would accept that the president could not intervene in the judicial process or grant clemency before the appeal process is exhausted, he added. Latheef said the legal team will decide whether or not to participate in the “charade” following consultations with Nasheed’s international lawyers. The state’s sudden reversal of stance may affect ongoing talks between the opposition and the government, lawyers suggested. Genser meanwhile told reporters today that he was denied a business visa to work in the Maldives last week and was told that he needed further authorisation from the Supreme Court certifying that he was licensed to practise law internationally. “There is no Maldivian law, regulation, or rule that imposes such a requirement on applicants for business visas who are lawyers – it appears the Supreme Court specially designed this requirement just for me,” he said. Genser is representing Nasheed along with Amal Clooney, the wife of Hollywood actor George Clooney, and Ben Emmerson, a UN rapporteur on counter-terrorism and human rights. The international lawyers have filed an appeal at the UN working group on arbitrary detention seeking a judgment declaring Nasheed’s imprisonment illegal. In a brief statement yesterday, the PG office said the decision to appeal the conviction was made based on concerns raised over due process in the trial and Nasheed’s request for the PG to appeal the conviction as well as his contentions over procedural violations, insufficient time to mount a defence, and inability to appeal due to the criminal court’s failure to provide a full report and transcripts of the trial within a 10-day period for filing appeals. Lawyer Hisaan Hussain noted that Muhsin had repeatedly rejected requests for the state to appeal the conviction, insisting that Nasheed could file an appeal despite the lapse of a 10-day period and that the PG would not appeal a verdict in his favour. The PG’s sudden reversal of stance while talks seeking Nasheed’s release were ongoing “raises questions about his purpose and intent,” Hisaan said. The Supreme Court had shortened the appeal period from 90 days to 10 by striking down provisions in the Judicature Act a month before Nasheed’s arrest on February 22. Last month, the High Court, citing lateness, rejected an appeal filed by the Prosecutor General over the acquittal of a defendant on murder charges. 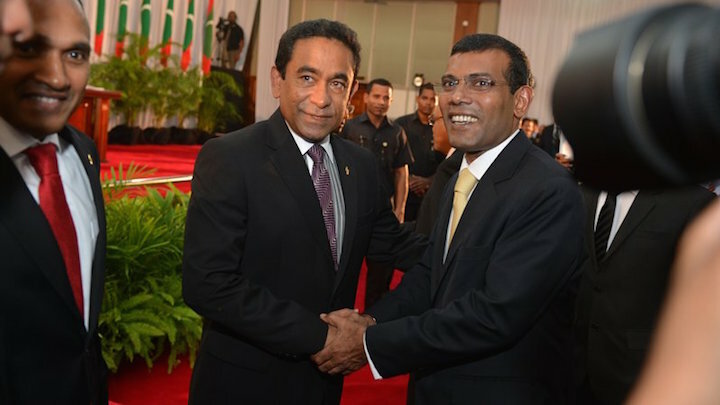 On June 20, President Yameen rejected Nasheed’s appeal for clemency, urging him to exhaust all appeal processes first. The opposition leader’s lawyers say that the Clemency Act grants the president the discretion, on the president’s own initiative, to commute the sentence of any individual convicted of a criminal offence. The next day, Nasheed was transferred to house arrest for eight weeks. Shortly thereafter, the MDP and the government began talks on clemency for Nasheed and other jailed politicians as well as the withdrawal of charges against some 1,400 opposition supporters. 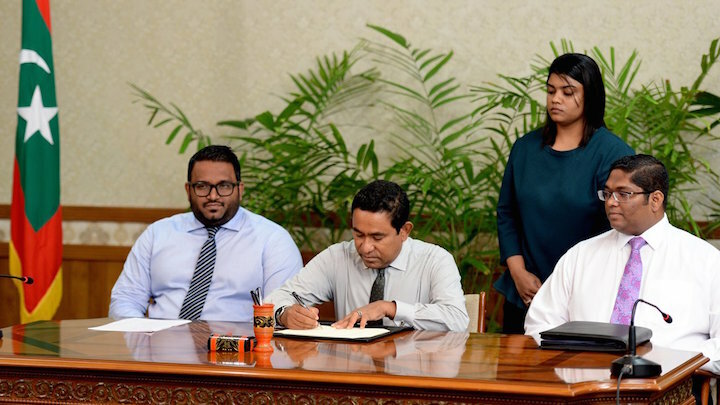 Opposition MPs subsequently backed the impeachment of vice president Dr Mohamed Jameel and a constitutional amendment setting new age limits for the presidency and vice presidency. The amendment allowed President Yameen to replace Jameel with the influential tourism minister Ahmed Adeeb. The MDP also issued a free whip on a second constitutional amendment to allow foreign freeholds in the Maldives. Some 19 opposition MPs, including ten MDP MPs, voted to pass the amendment. At the fourth meeting of talks last week, MDP representative Ibrahim Mohamed Solih had suggested that Nasheed may be released before July 26. Citing irregularities and rights violations in the terrorism trial of former president Mohamed Nasheed, the Prosecutor General has announced today that he will appeal the criminal court’s verdict. The decision comes amidst rumors that President Abdulla Yameen will pardon the opposition leader ahead of July 26, the day Maldives marks 50 years of independence from the British. Article 233 authorises the PG to appeal any judgment, verdict or decision in a criminal matter. It may take days for the appeal to begin with state offices closed until July 29 for independence day celebrations. The criminal court will now have to issue a trial record and the High Court registrar will then make a decision on accepting the appeal. Nasheed was found guilty on terrorism charges over the military’s detention of criminal court chief judge Abdulla Mohamed in January 2012. Ibrahim ‘Ibu’ Mohamed Solih, MP of the main opposition Maldivian Democratic Party (MDP), said he could not comment as Nasheed’s lawyers were presently discussing the development. The MDP and the government subsequently began talks on clemency for Nasheed and other jailed politicians and withdrawal of charges against some 1,400 opposition supporters. The opposition has backed several government proposals in hope of freedom for Nasheed, including the impeachment of vice president Dr Mohamed Jameel and a constitutional amendment setting new age limits for the presidency and vice presidency. The amendment allowed President Yameen to replace Jameel with the influential tourism minister Ahmed Adeeb. At the fourth meeting of talks last week, Ibu had suggested that Nasheed may be released before July 26. The UN working group on arbitrary detention is expected to rule on Nasheed’s imprisonment in September or October. In a response to the UN, the government insisted Nasheed must appeal the sentence. The opposition leader’s lawyers maintain they have no legal avenue to file an appeal as the Supreme Court had shortened a 90-day appeal period to 10 days, weeks before Nasheed’s trial began. The High Court, citing lateness, last month rejected an appeal filed by the Prosecutor General over a murder acquittal. Public prosecutors blamed the delay on the criminal court’s failure to issue a trial record, as had happened in Nasheed’s case. Meanwhile, the Supreme Court last week acquitted a convicted drug trafficker citing irregularities similar to that raised by Nasheed’s lawyers. In the unprecedented ruling, the apex court said the accused was not given access to a lawyer or the opportunity to call defence witnesses. In a separate development, only four of the nine High Court judges are eligible to hear Nasheed’s appeal. This is because of two factors; three judges were transferred to a newly created appellate court branch in the south on June 23 and two of the three presiding judges in Nasheed’s prosecution were promoted on June 8 to fill two vacancies at the High Court. Since the Judges Act states that an odd number of judges must preside over appeals, Nasheed’s appeal can still proceed with three judges. An appeal filed by ex-defence minister Mohamed Nazim was stalled at the High Court when the Supreme Court transferred judges overseeing his appeal to the southern branch. UK Prime Minister David Cameron, the European parliament, and influential US Senators have called for Nasheed’s immediate release. Reporting by Ahmed Naish and Shafaa Hameed. Writing by Zaheena Rasheed. Sri Lankan President Maithripala Sirisena is the only head of state to confirm attendance at the July 26 celebrations to mark the Maldives’ golden jubilee of independence from the British. An invitation for India’s Prime Minister Narendra Modi is still open, she said. “President Yameen’s invitation to Prime Minister Modi is still open. He can come at his convenience and will be welcomed by the Maldivian government,” she said. In March, Modi dropped the Maldives from a tour of his Indian Ocean neighbors. The cancellation came amidst daily anti-government protests and heightened political tension sparked by the arrest and prosecution of former President Mohamed Nasheed. Opposition supporters expected President Yameen to pardon Nasheed by July 26, but instead the Prosecutor General has announced he will appeal the criminal court’s verdict. Nasheed was sentenced to 13 years in jail on terrorism charges relating to the arrest of a judge during his tenure. He is under house arrest at present. Dunya dismissed today rumours that Nasheed had been invited to the official function. 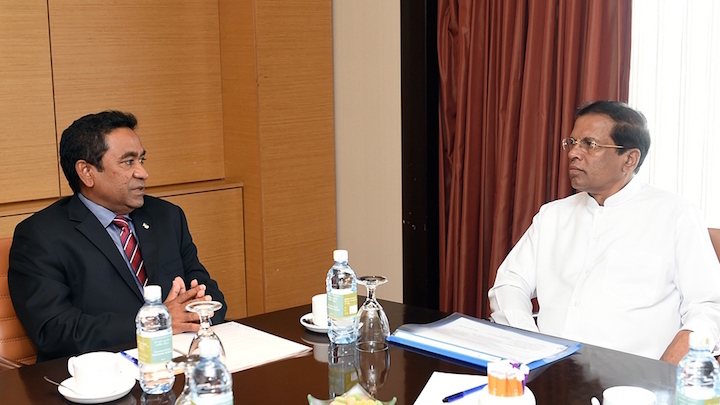 Sirisena will be the second head of state to visit the Maldives since the current administration assumed office in November 2013. Chinese president Xi Jingping visited the Maldives last year. Other foreign dignitaries who have confirmed their attendance include, the vice chairman of the China’s lawmaking Standing Committee of the National People’s Congress, foreign ministers of Nepal and Palestine, deputy foreign ministers from Japan and Bangladesh, and other ministers from India, Pakistan and Saudi Arabia. Many diplomats are also expected to attend. 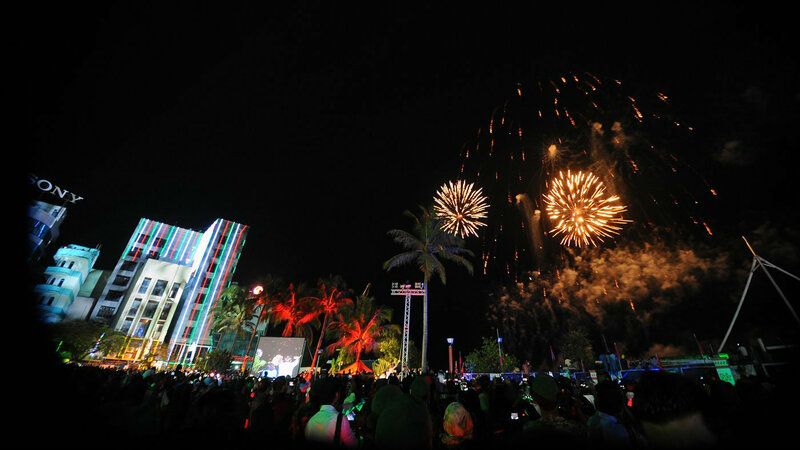 The home ministry plans to light up all of Malé in LED lights and is rushing to complete preparations. Government offices, the Supreme Court building, the parliament building and main streets have been decked in red, green and white lights. 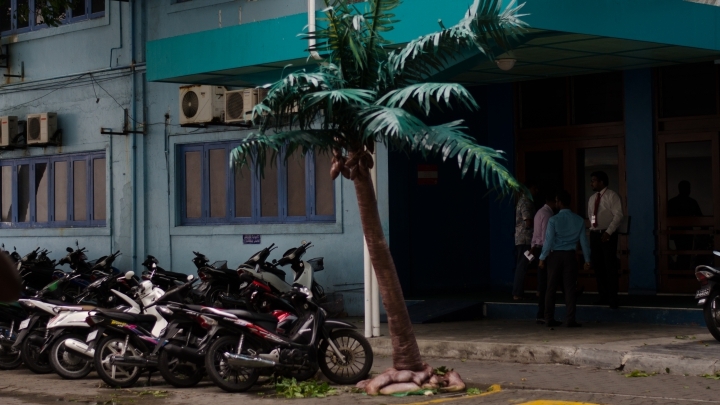 However, power shortages in Malé may spoil plans.